When positions become available in my group, they will be advertised in several places, including the website of the American Society of Pharmacognosy. If you are interested in joining my group as a postdoctoral scientist, you should email me directly. In doing so, please outline your interests and skills and how these may match the expertise and needs of my research group. The Department of Chemistry and Biochemistry has graduate programs for students interested in either the Ph.D. or M.S. degrees, and more details can be found on the Department’s webpage. 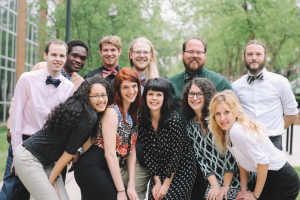 Applications to the graduate program are processed by the graduate school of the University of North Carolina Greensboro, and must be submitted through this link. If you are accepted into the graduate program, you will be required to interview several professors in search for a good fit, both for the professor’s needs and your own interest. Typically, I accept one or two graduate students each year, depending on resources. I do not make a decision about who to accept until after I have had a chance to meet with all interested students for the fall incoming class. Thus, at the time of admission, I cannot guarantee a position in my group. However, I am perfectly happy to discuss my research in more depth with prospective graduate students before they are officially accepted in the program. Please feel free to contact me by email for such discussions. For details about expectations for graduate student members of the Cech research group, please see this link to the syllabus. I typically accept several undergraduate students into my group each fall, depending on the size of my group. Preference is given to students who can make a long term commitment to research and have demonstrated strong performance in chemistry coursework. Students typically start out by taking research for credit (usually as CHE491 or 492). For these courses, the expectation is 4 hours of work in the laboratory per week per credit, and students typically sign up for 1 to 3 credits (it is a variable credit course). A final written laboratory report must also be submitted each semester. All students participating in research are also expected to participate in weekly group meetings. In some cases, I also hire undergraduate students by the hour to conduct research. Students who are currently members of the Cech group are given preference for these paid research assistant positions. If you are interested in my research group, complete this application and send to me as email attachment.